Get ready to celebrate the 60th birthday of your friend or family member! 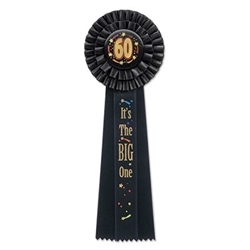 Turning 60 is a big deal and nothing says that more than the 60 It's The Big One Deluxe Rosette Ribbon. The 60 It's The Big One Deluxe Rosette Ribbon is made of black material and includes gold metallic lettering and graphics. In the center button of the rosette ribbon is a gold 60 and on the center tail of the ribbon are the words "It's The Big One". These ribbons are great to give in sincerity or as a gag gift to someone. Either way we're sure that any recipient is sure to appreciate these awesome ribbons. Make sure to also check out the 60 and Sensational Deluxe Rosette Ribbon and Happy 60th Birthday Beads of Expression.